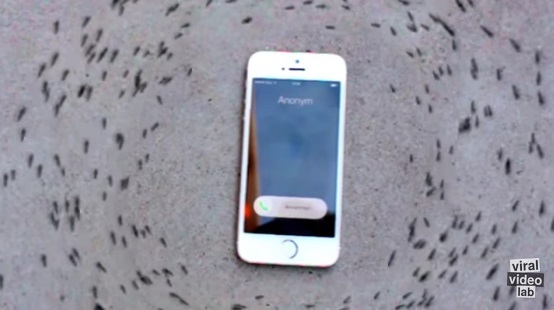 A recent video that has gone viral in the internet shows ants circling around an iPhone and moving in uniform circular motion. The ants are apparently dancing around the iPhone whenever it starts ringing. The video has raised questions in minds of engineers, researchers and scientists and they have been trying to figure out the cause underlying the bizarre incident. ViralVideo Lab, the community that posted the video said that electromagnetic radiation is transmitting from the phone while a call is coming into the phone. This em radiation might be the plausible reason for the circle movements of the ends. Nigel Andrew from the University of New England gave similar reasons to Yahoo7. He said that ants utilize the electromagnetic field of earth to chalk out the direction out of north, south, east and west in which they are moving. The electromagnetic radiation coming into the phone mught have interferred with their antenna thus baffling their normal movement. Simon Robson, a social insect specialist at James Cook University, told Yahoo7 that the phenomenon is simply “an unavoidable consequence of the [ant’s] communication systems.” He thinks that the ants woukd have followed the same path, even without the phone. Ants have an innate tendency to move in circle around things. Even while eating they position themselves in circular shape. So the shape of the phone or the natural behaviour of the ants would have done that also. Sanford Porter, an entomologist from USDA, told Discovery News that trail pheromone is another credible reason that might have caused the ants to movr in circles. The “trail pheromone” or “trail chemical” of the ant in front of another ant influences it and thus the ants “endlessly follow their neighbour” in loops.